A family member, a.k.a. Goliam Praz , has been craving Imam Bayalda for ages. Cooking this traditional BG dish is quite labor intensive and time consuming so I do not cook it very often. Since today I have a holiday and GP is working hard to bring home the bread, his request has been carefully considered and finally granted. It was pouring with rain this morning, but I bravely put on boots and a rain coat and ran to the store for eggplants. Choosing the right eggplants is important for the dish success. They should be ripe and sweet, not bitter. Fortunately, there was only one type of eggplants :) in the store, so I did not contemplate for long, bought five pieces and came back home, mentally prepared for the cooking. STEP 1. 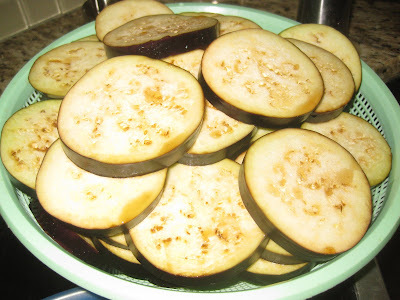 Cut off the eggplants to 1" slices, sprinkle with salt and left them to rest. It takes at least two hours till the salt drains out the bitter juices out of the eggplants. You can leave them even overnight. STEP 2. Prep the rest of the veggies. Clean and chop them into small pieces. STEP 3. 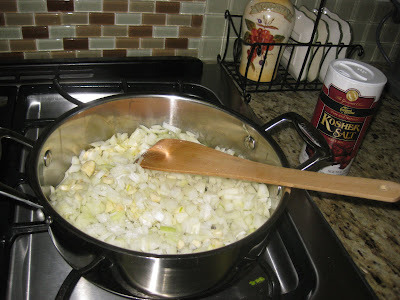 Saute the onions and garlic in two tbsp olive oil, till they become soft. Add half a tsp with chili pepper flakes. STEP 4. 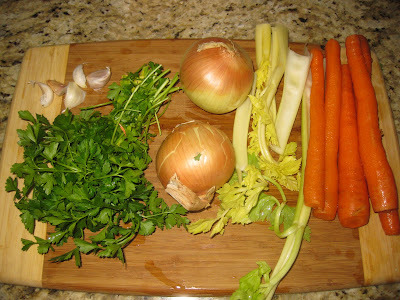 Add the carrots, the celery and continue sauteing for about 5-6 minutes. 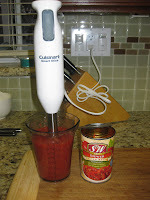 Then add two tsp tomato pure and two cans tomato sauce. 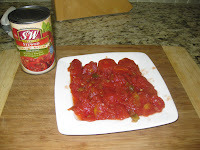 I used two cans of stewed tomatoes, fished out the tomato slices from one of the cans, saving them for the top layer of the Imam Bayalda. 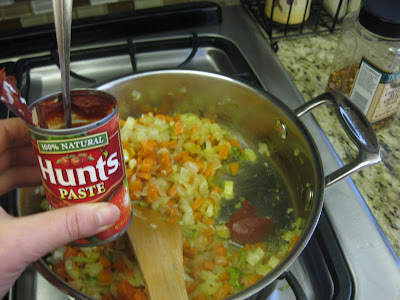 Then, I pureed the second can and the rest of the first can and added the mix to the pan. STEP 5. Reduce the heat and continue cooking the mix for about 15 more minutes. 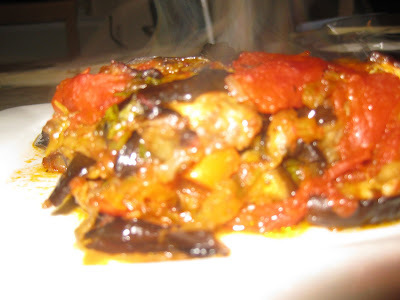 The traditional recipe involves frying the eggplants, and at the end the dish is very tasty but quite oily. The eggplants absorb a lot of oil during the frying. 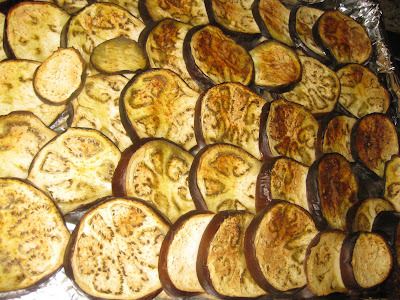 Determined to create a healthier version, I decided to try out a new method - roasting the eggplants in the oven. STEP 6. 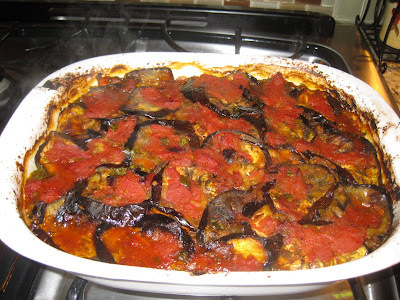 Preheat the oven to 450 F, in time to bake the eggplant. Cover two cookie sheets with aluminum foil. 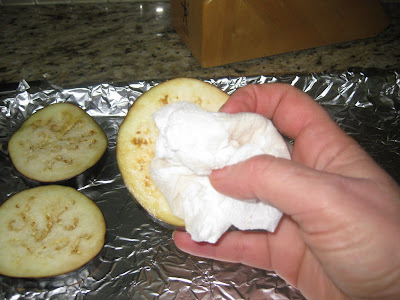 Wash the eggplant slices under cold water squeeze out the juice and dry on paper towel. Sprinkle with olive oil and roast in the oven for about 20 minutes. STEP 7. 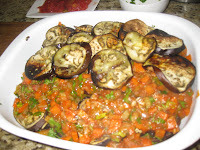 Next assemble the dish, put layers of eggplant topped with the carrot mix and sprinkles of parsley. STEP 8. 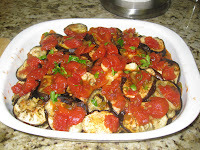 Finish the dish with a layer of eggplants, and top them with the tomato slices. Cover the pan with foil and bake it at 400 F for an hour. At the end, bake without the foil for 15 minutes. Oh oh oh, I wish you could send me some - I LOVE LOVE LOVE imam baialdu! I had the imam bayalda for dinner last night, and today for lunch. It’s delicious, well balanced on spices, not oily like the one they use to make back then in BG. Not enough English word to describe how good it is…..